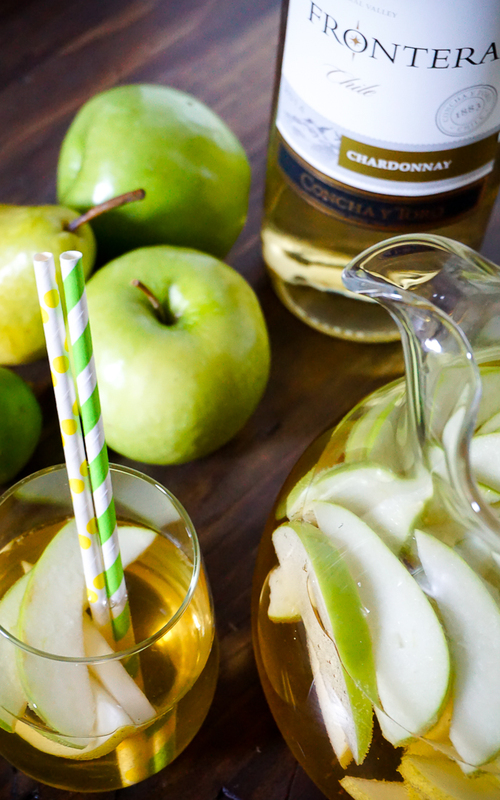 Green Apple and Pear Sangria will be a huge crowd pleaser with the perfect combination of sweet and tangy! Here’s the deal – I don’t like beer and I’m not really a huge fan of football, either, so Sundays would get a big boring around here for me by game 3. When your husband has 4 Fantasty Football teams, you are pretty much guaranteed to have the games on all day long. I’m pretty sure he even has a countdown happening for the Big Game! 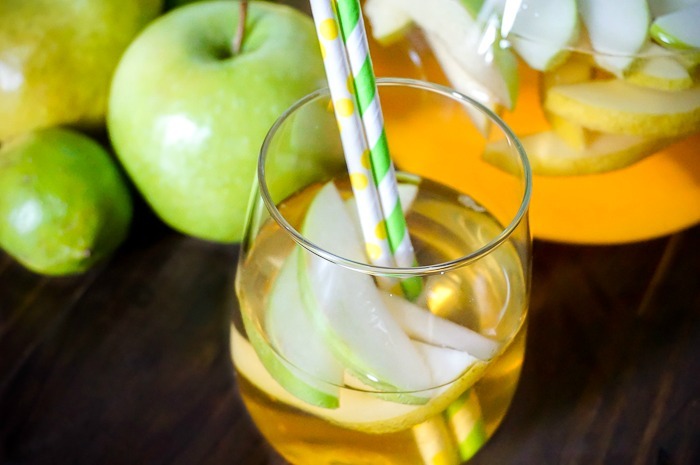 I needed to find a way to make football Sundays fun for me, too, and I definitely found it with this Green Apple and Pear Sangria! It’s not like there is a referee in our living rooms telling us all to drink beer during the game, and yet, it seems to be the main belief. The amount of beer commercials alone shown during the games is astounding. I, however, prefer sipping on a glass of sangria so I think you will be amazed at how many of your guests are in my camp. The best part? Sangrias look super pretty and will impress your guests, but they are really easy to make. I have always been a huge fan of sangria and love making different varieties, but this has definitely become an instant fave. Adding the more tangy, citrus flavors with Frontera’s Chardonnay offers the perfect balance of sweet and tangy. Even Bryan loved it! I think the green apple, pear and lime will really appeal to men, too, over something like a raspberry version. If you haven’t tried Frontera Wines yet, I highly recommend it. They have a variety of grapes and wines, which means there is something for everyone, and it comes at an amazing price. When serving a crowd for the Big Game, this was truly such a value for a delicious recipe. Plus, if you pick up a bottle, you can enter the Frontera Game Day Photo Contest for a chance to win $1,000.00! How amazing is that?! All you have to do is snap a picture of your guests enjoying the wine during your party for the Big Game. Check out all the details on the Frontera Facebook Page. All all ingredients to your pitcher and chill. Make first thing in the morning or the night before to allow fruit to soak. 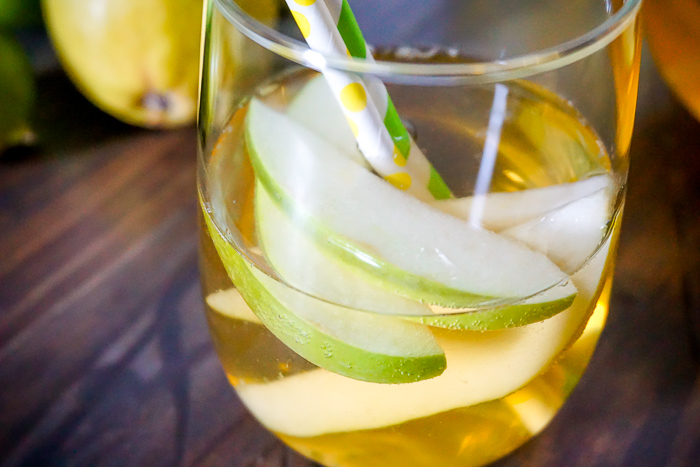 If you like this Green Apple and Pear Sangria, you should head over for more cocktail ideas on the Frontera Website. There are so many easy recipe ideas for you to spruce up your next party, like this Chardonnay Al Fresco!